A very attractive lilium originally from China, Lilium regale has been in cultivation for over 100 years and is really an easy care plant for garden. Wonderful white flowers with purple markings on the outside and a yellow throat, this is a species that will flower around Christmas time in Australia and thrives in out garden. 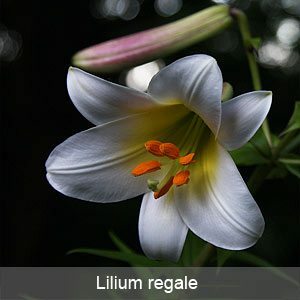 You can also grow these Lilium regale in containers, remmeber to use a deep container, keep the comtainer in a cool position where the flowers stems can rise into the sun. When growing this way we suggest you use some system of support. Best grown in a humus rich well drained soil, we dig over well before planting liliums, we like to add some well rotted compost and a little aged animal manure. It is best to prepare soil in advance to that it has time to ‘settle’ before planting. In our garden Lilium regale gets good morning sun and dappled afternoon shade and this seems ideal. Plants will reach a height of around 1m, and as these pretty liliums can have 8 flowers or more a little support can help. Ours are left to wend their way through some low growing azaleas, which provide natural support, some growers use plant hoops to keep them upright, other just let them go. In hot summers a little extra water is required, although these are a tough hardy bulb and we rarely water at all. Try a little liquid seaweed fertilizer in spring when the new shoots begin to appear, and once the foliage dies back in late summer, top dress with a little mulch. If you are going to use these as cut flowers remember to leave at least 1/3 of the foliage so that the bulb can get some nutrition. Remember not to cut the foliage back until it dies right down. A humus rich well drained soil is required. Bulbs need to be planted at around 15cm to 20cm (6 – 8inches) deep. These are a tall growing lily so consider planting then towards the rear of the garden border. They can be grown in containers, however will need some support. Propagation of Lilium regale is easiest by division of established clumps, we like to do this in late winter to early spring when new growth is about to commence. Yes you can grow from seed, and bulbs can be scaled as well, but we leave this up to the experts.